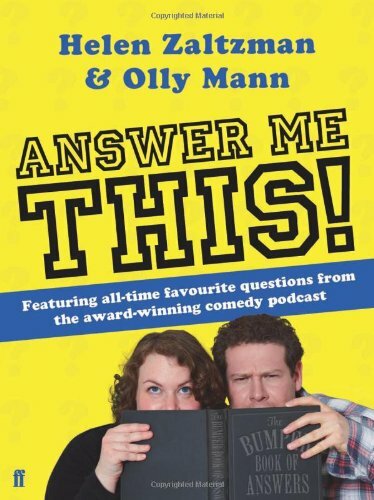 Faber and Faber publish my book, Answer Me This!, co-written with Helen Zaltzman and based on our comedy podcast of the same name. The book is a compilation of our favourite questions from the first four years of the show – from the intellectual (‘Why is Macbeth considered an unlucky play?’), to the absurd (‘How can I recreate a music festival in my office?’), to the frankly revolting (‘Could you make black pudding out of menstrual blood?’). Rather than merely transcribe the podcast, though, we created all-new answers to the questions, taking plenty of time for visual gags and anecdotal tangents! Download a free PDF sample of the book here. Reviewing the book in The Guardian, comedy critic James Kettle called it “a cheerful and chunky volume that’s perfect for the festive market… and acts as the perfect introduction to Zaltzman and Mann’s offbeat but infectious sense of humour“. Heat magazine awarded it four stars, calling the book “a great collection” and “very funny”.